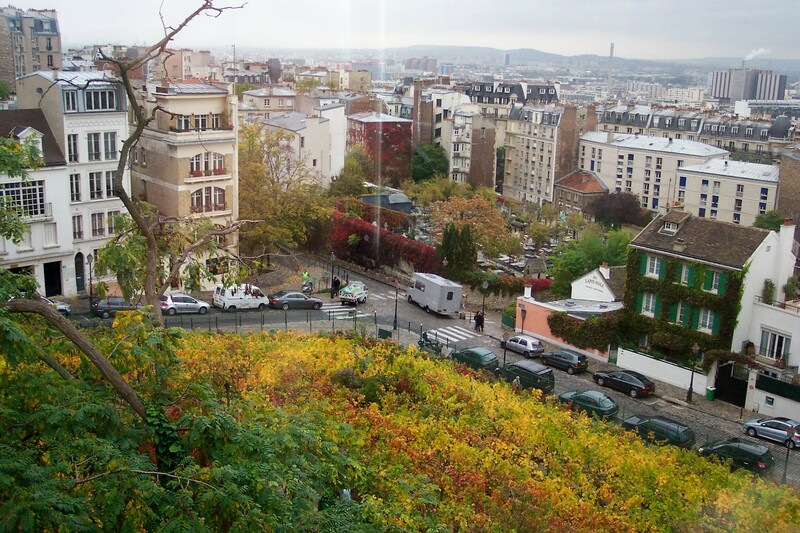 The ETs willingly succumb to the charm of Montmartre , despite the wild throngs of tourists in search of Utrillo and other starving artists from it”s golden years. Hoping to get a sense of neighborhood life on the butte, Melinda and I made the climb one evening, after the tour busses departed. 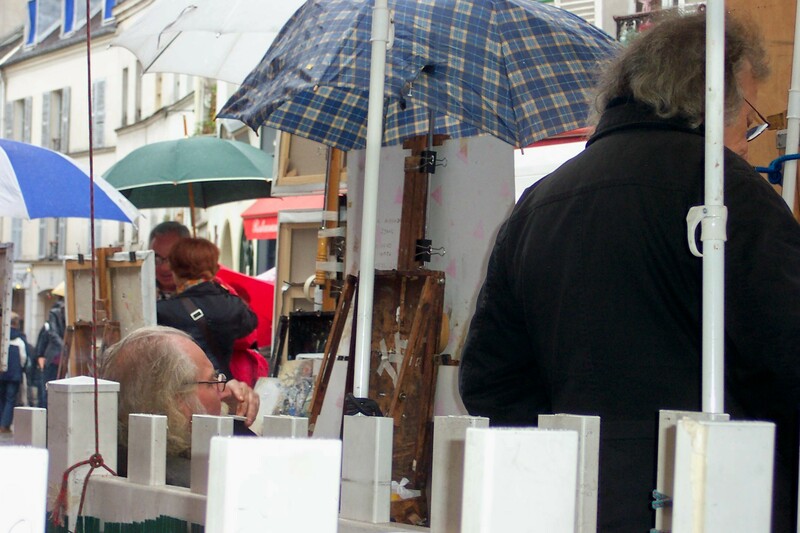 We wandered around looking in shops and admiring village architecture masked by windows hawking teeshirts and Monet-themed umbrellas. It wasn’t long before we were hungry, with nothing to guide us but posted menus and the apparent satisfaction of patrons on the terraces. 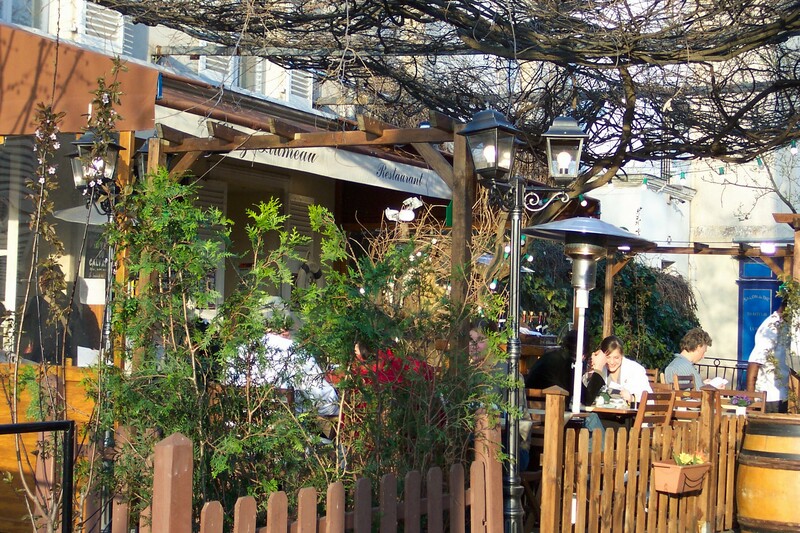 Dining in Montmartre can be a hit-or-miss proposition. 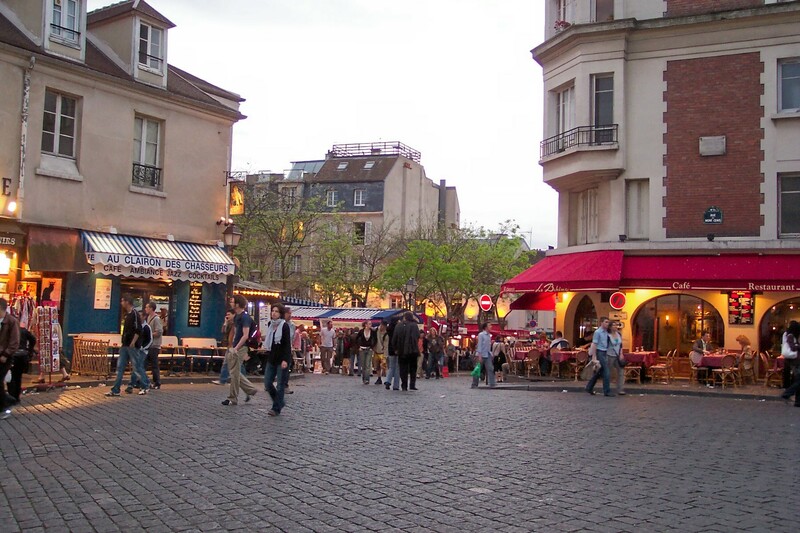 On past visits, I avoided the central place du Tertre which is overrun by the aforementioned crowds. 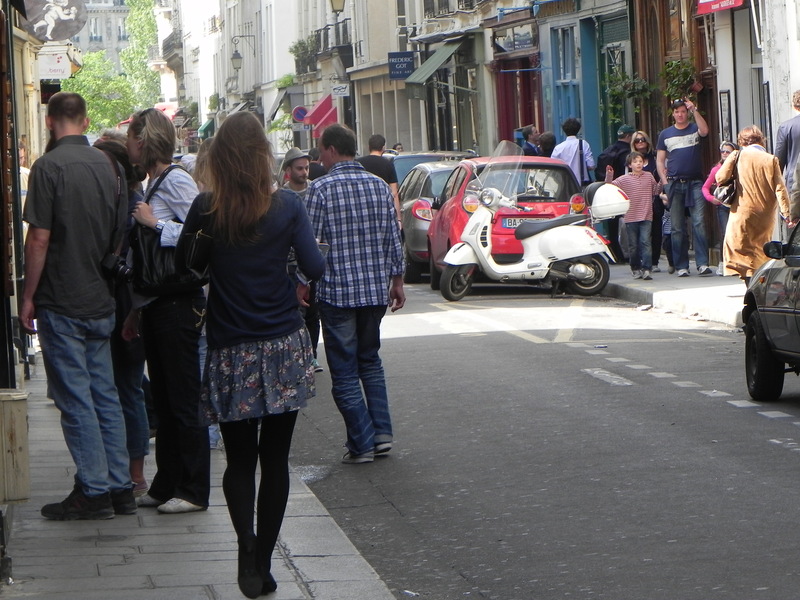 But we were hungry, and somehow the crazy circus of passers-by fit our mood, so we decided to give it a try. 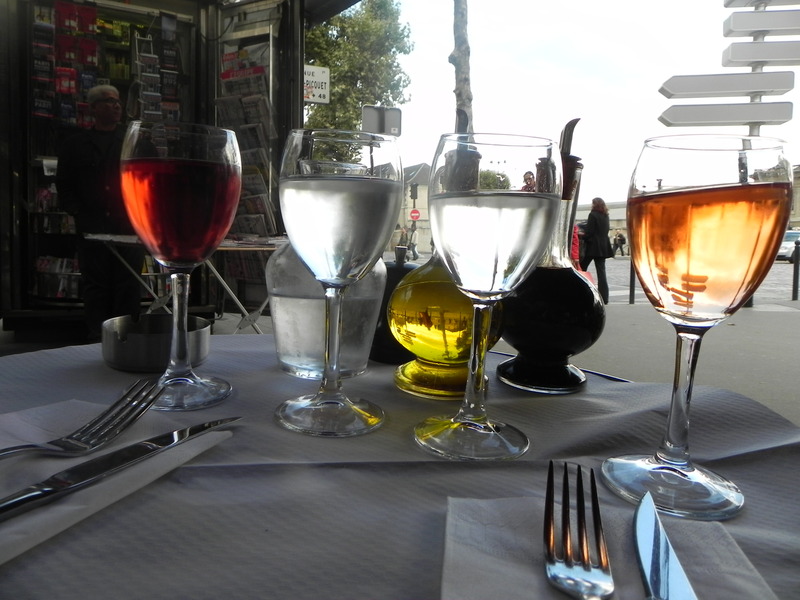 We found an outdoor table at Chez La Mère Catherine on the perimeter of the action, and got to work immediately by ordering our first bottle. 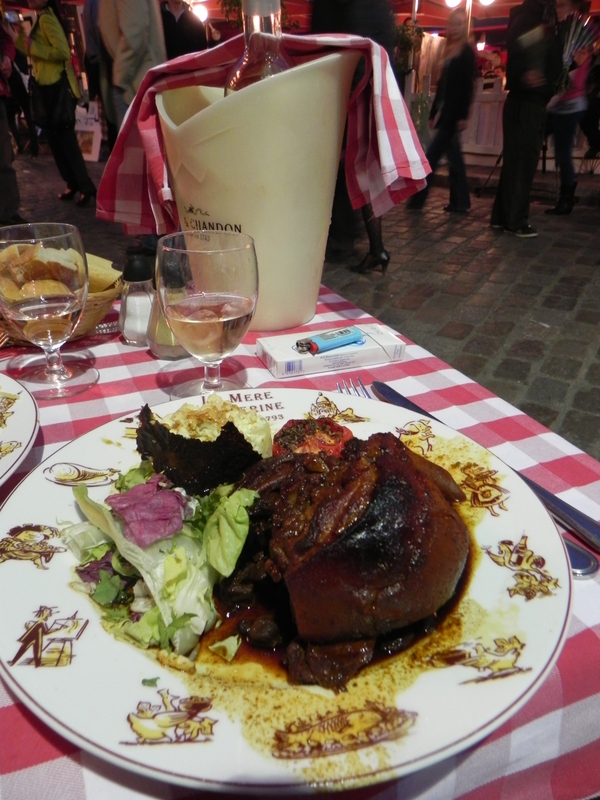 Wine is welcome at any meal in Paris, but mandatory for an evening in Montmartre. It turns out that we made a fine choice. 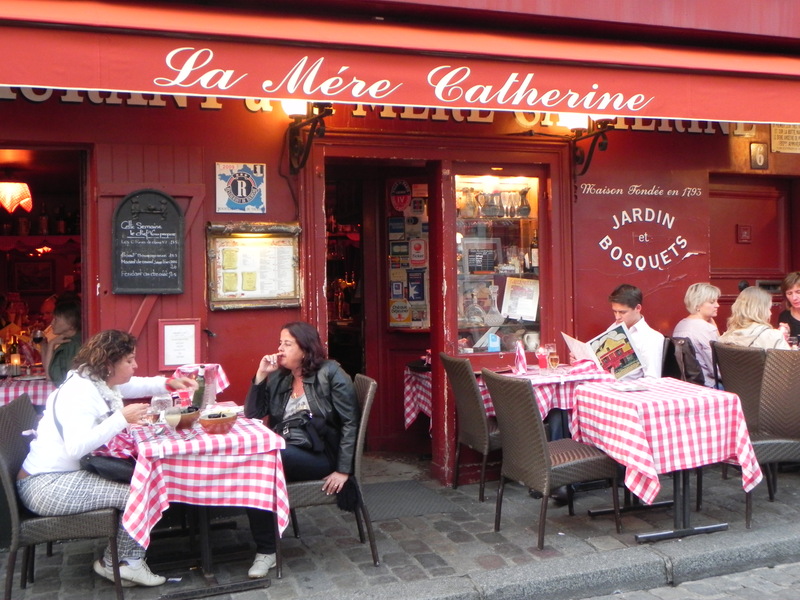 Chez La Mère Catherine has been dishing up frogs legs, pork confit and crêpes suzette since 1793. Opening a restaurant in the midst of the revolutionary Reign of Terror demonstrates a commendable optimism on the part of Mère Catherine. And it was optimism well placed. 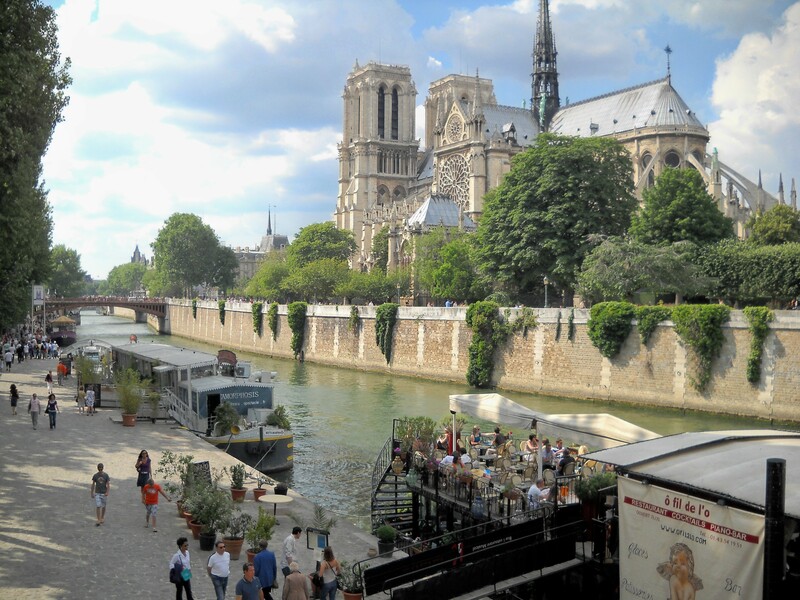 Her restaurant has outlasted two French Republics, the Paris Commune, the Second Empire, the Siege of Paris, the Nazis and the introduction of the Euro. 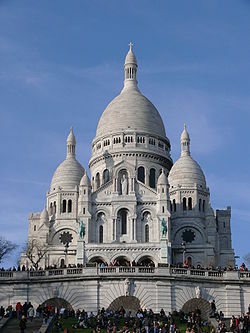 It is said that during the Battle of Paris in 1814, some invading Cossacks slipped off to Montmartre for a taste of Paris nightlife and made their way to La Mère Catherine. Out on the town without the knowledge of their senior officers, the soldiers had alot to do in a short time. Between rounds, they yelled “Bistro! Bistro!” (Hurry! Hurry!) and coined the term. 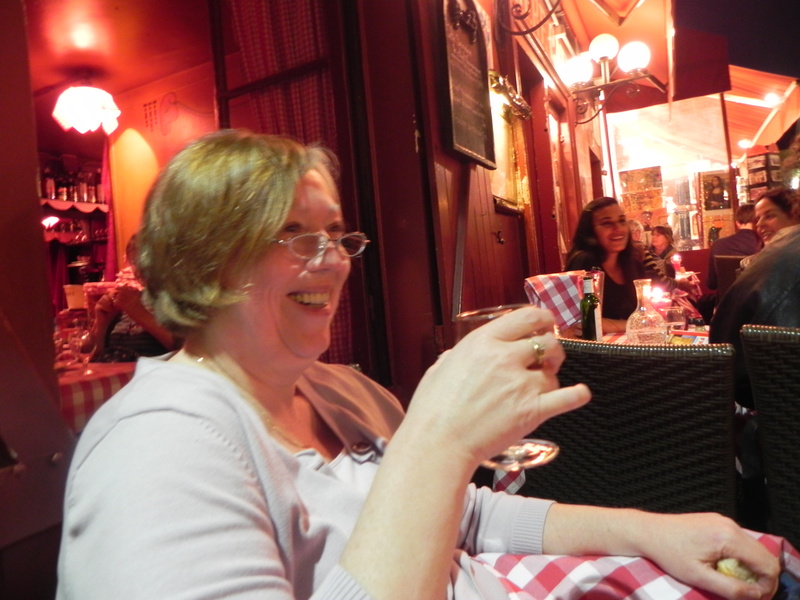 The ETs feel justified when they can learn history while dining out in Paris, and here we find that Mère Catherine was right in the midst of it all! Once our attentive waiter advised us on dinner, we settled back to watch the show unfold. 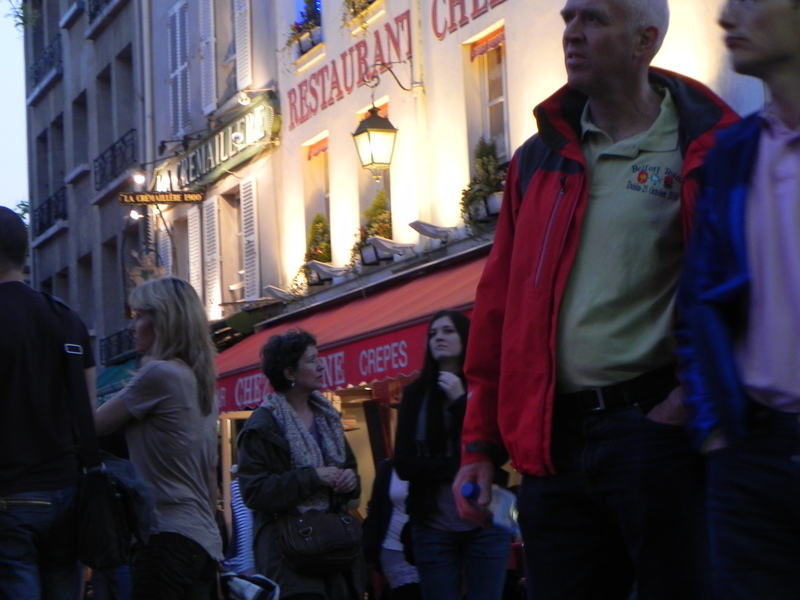 Before us went groups of kids out for a Friday night, befuddled tourists swept along by the crowd and hungry portrait artists in search of paying subjects. This was better than the Lido, and cheaper too. 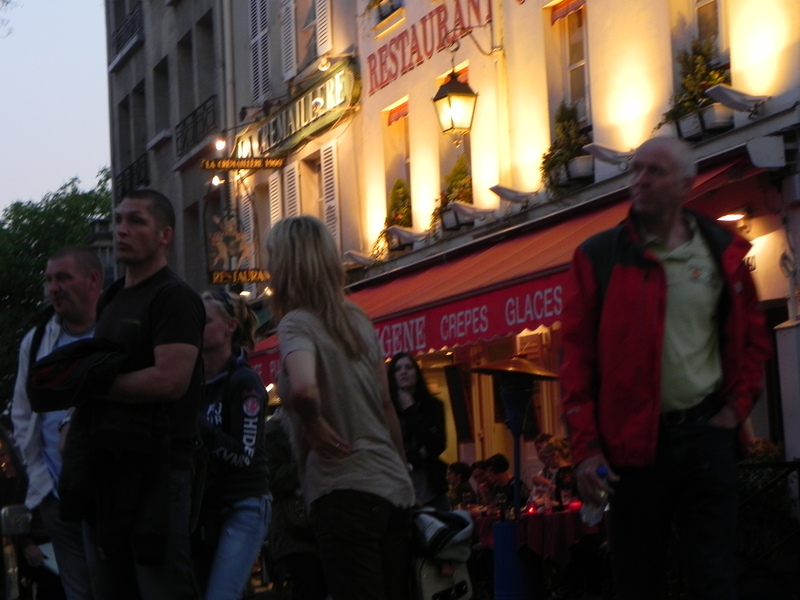 I don’t mind the Montmartre crowds when I am a drinking spectator with dinner on the horizon. At last our meal was served. Melinda chose tender pork marinated in cider with potatoes lyonnaise that were fine. 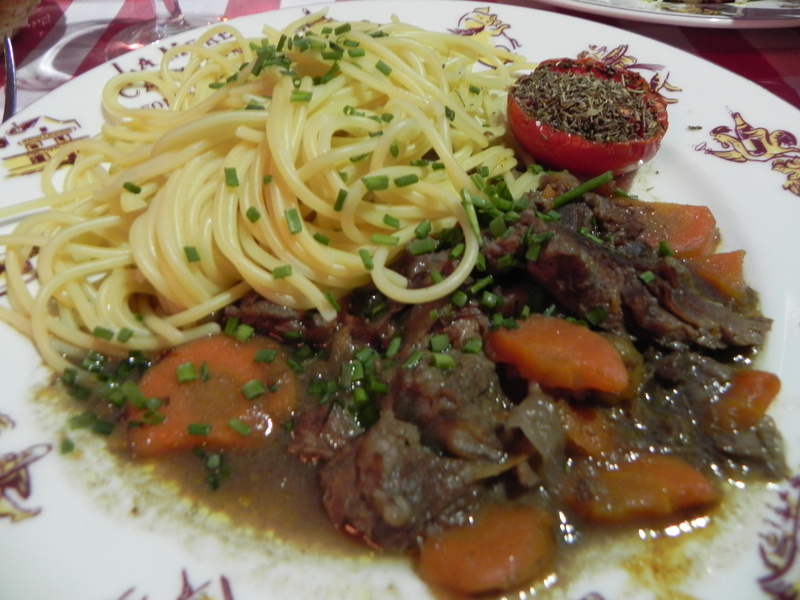 I had the ever-popular beef bourguignon with pasta and a grilled tomato that was adequate and filling. 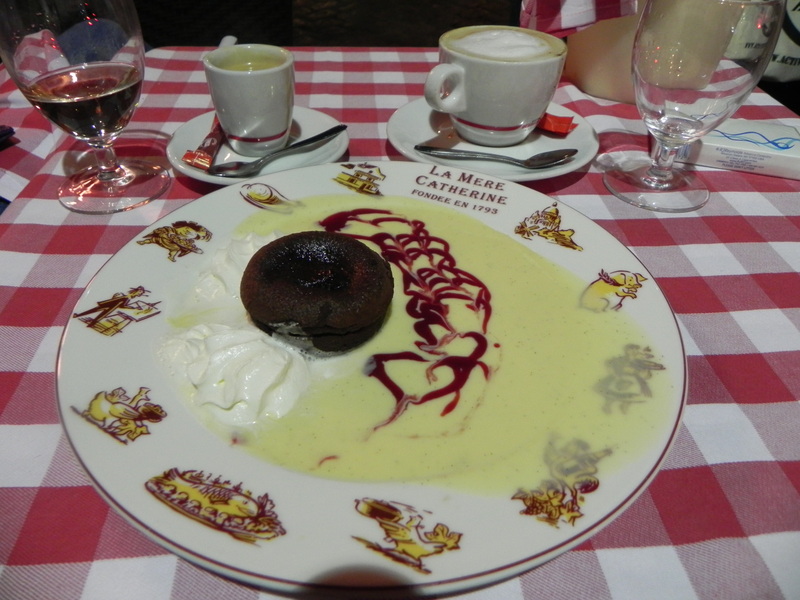 Our satisfaction rose with the arrival of a gâteau au chocolat with crème anglaise and raspberry coulis. Mère Catherine is a purveyor of standard cuisine and on that count, she delivers. This wasn’t a Michelin meal. 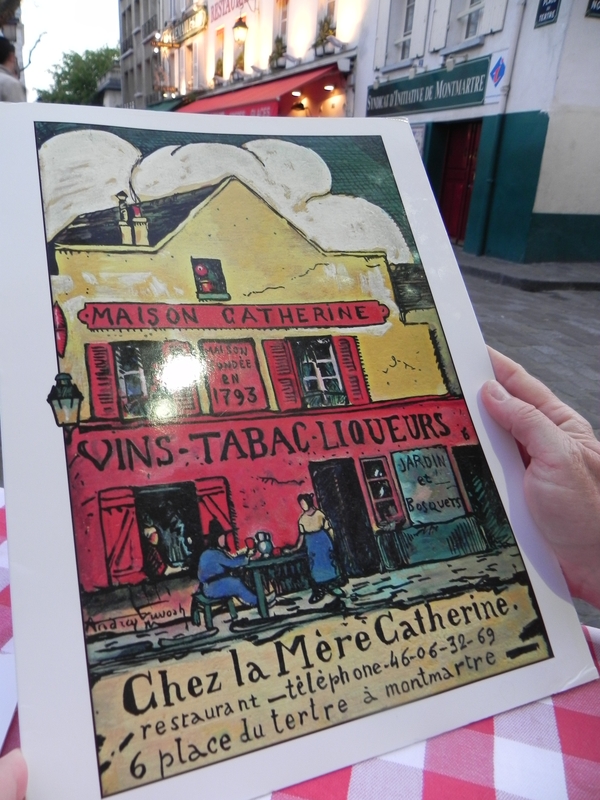 But dear Readership, consider the balmy evening breeze, the checkered tablecloth, the warbling chanteuse accompanied by a rickety old piano, the entertainment in the place du Tertre and the warm goodwill engendered by the wine. 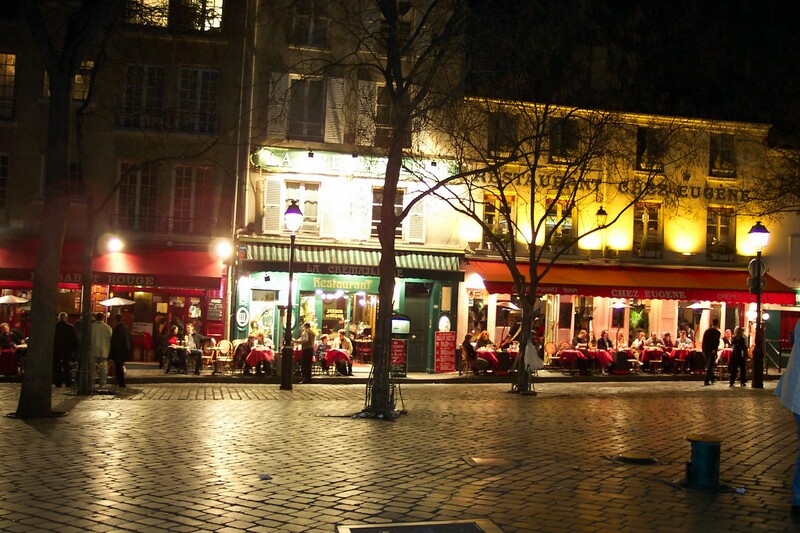 Clearly, you can have a delightful night out in Montmartre. Popular lore claims that it was here that the revolutionary Danton wrote “eat, drink and be merry, for tomorrow you may die”. That was far more likely in Paris of 1793 if you were a fleeing aristocrat with the family jewels sewn into your seams. 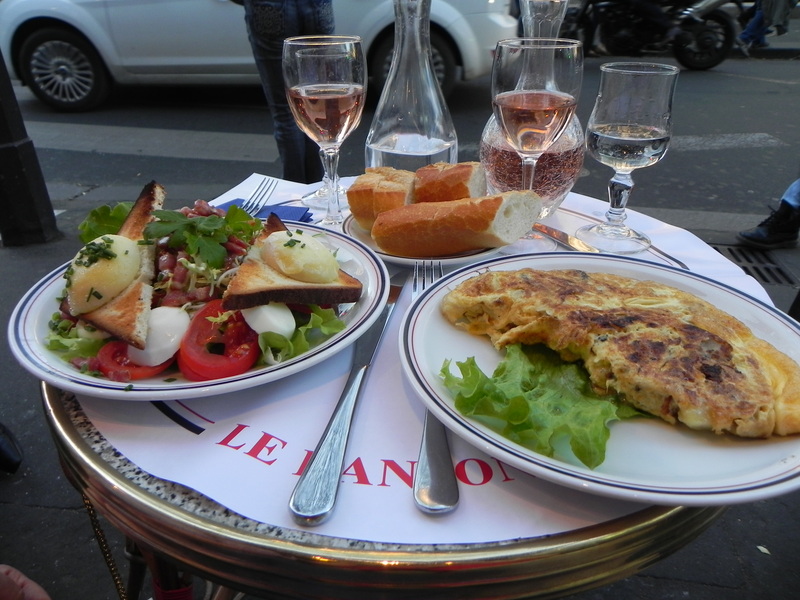 Yet the ETs agree we could fare worse than to make our final stop at Chez La Mère Catherine to enjoy the ambiance over a leisurely, satisfying meal before the guillotine falls. What might Danton have made of the raspberry coulis? Vive la France! 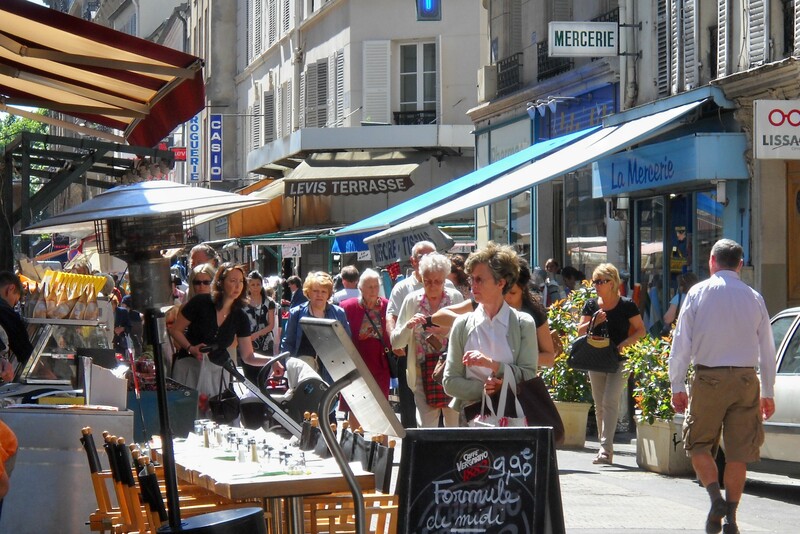 The Experienced Travelers appreciate variety, and we’ve certainly had ours on this latest visit. 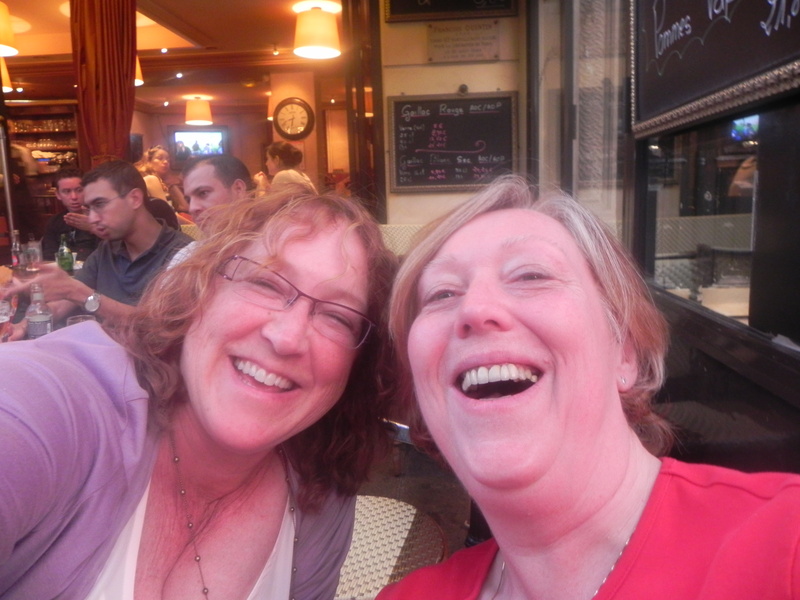 Our dinner in Montmartre last night was a blast. 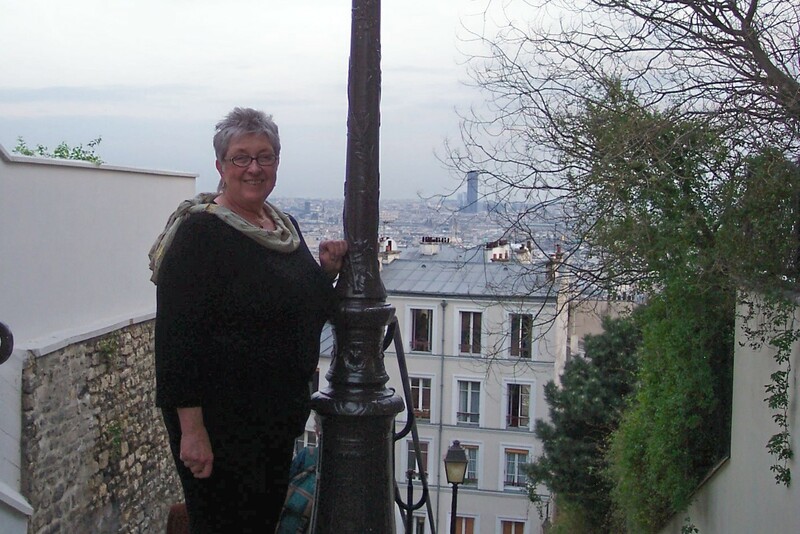 We heeded Nurse’s text message “Montmartre – fun. Pigalle – oh la la, non.”. 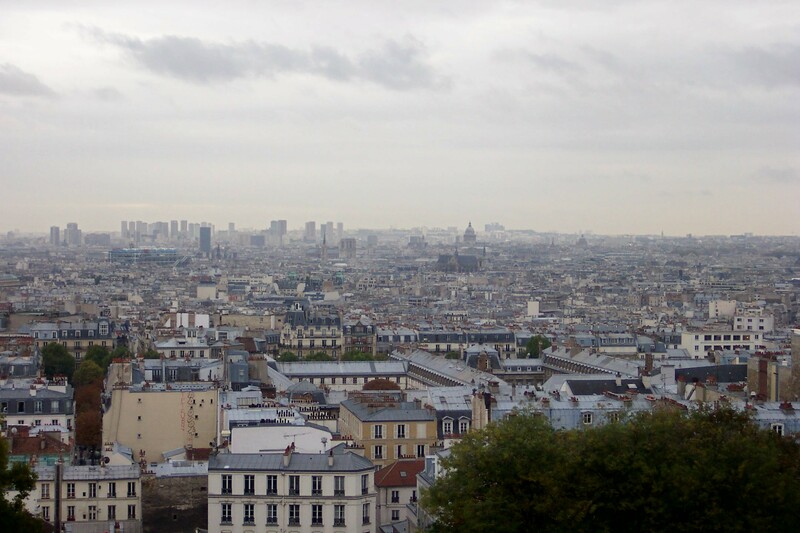 Clearly, raucus living high above Paris agrees with us. We rose early enough to fit in a full day today. 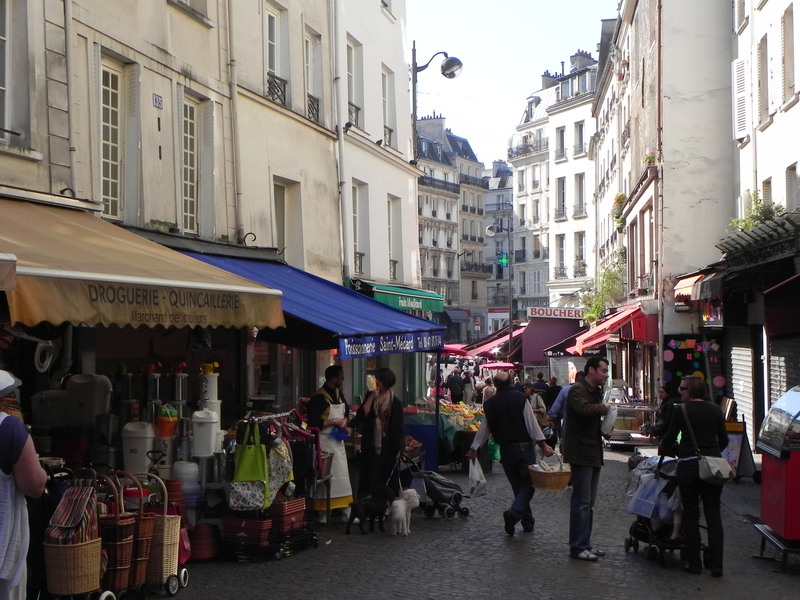 Here’s a quick moment from our visit to the market on the rue Mouffetard. The colorful blooms and bundles of white asparagus announce Spring. 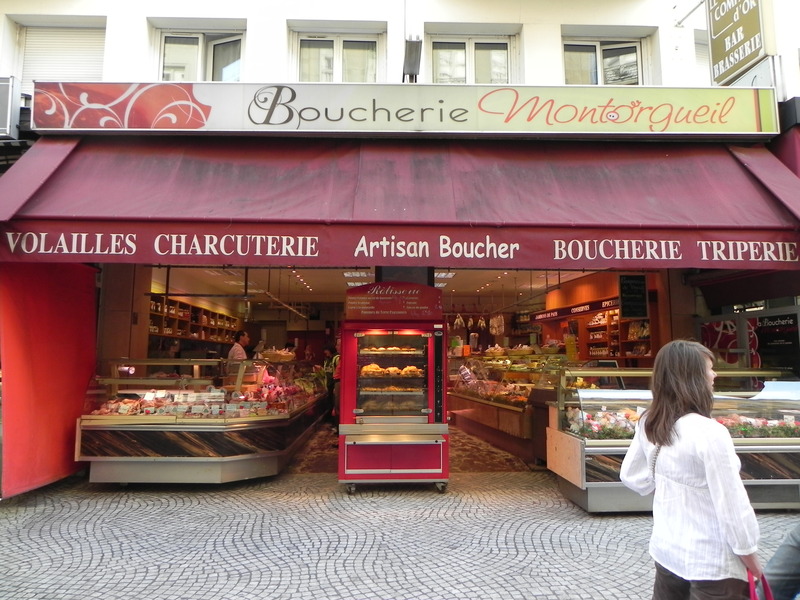 Cheeses and delectables were for sale by hard-working shopkeepers. Neighbors chatted, compared prices and bought for their Saturday night dinner. We’re headed out for our Saturday dinner and a restaurant I haven’t tried before. Will post again when the wireless internet cooperates! Mise en place in Paris. All that's missing is an ET. 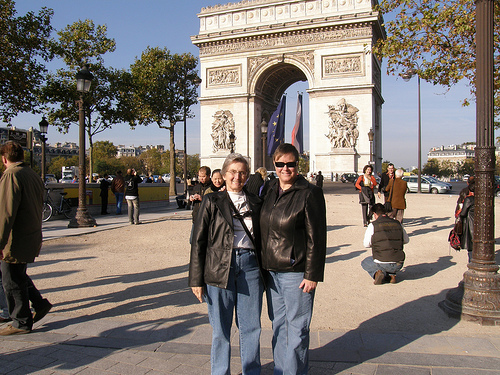 The Experienced Travelers toil and sacrifice to entertain the Readership with anecdotes about Paris. 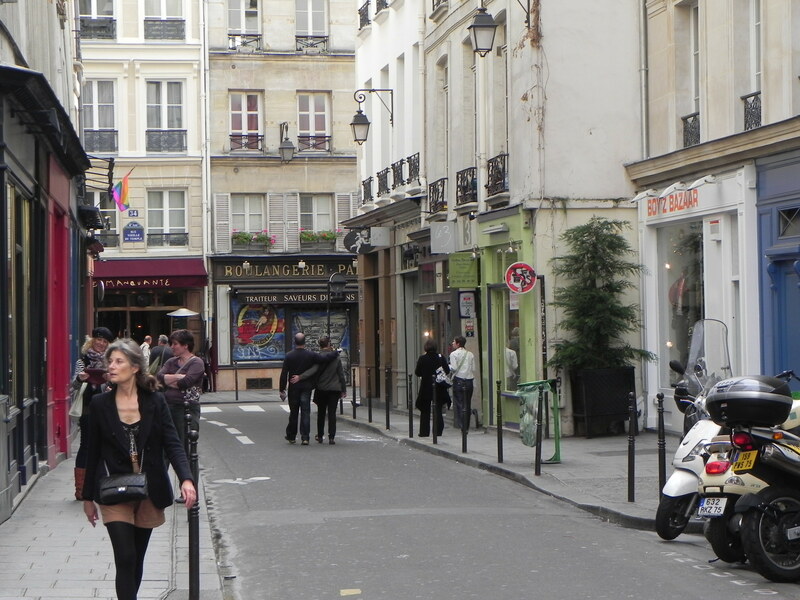 From time to time, we must refresh our photos – and our palettes – with exquisite new wonders to share on Julie’s Paris. 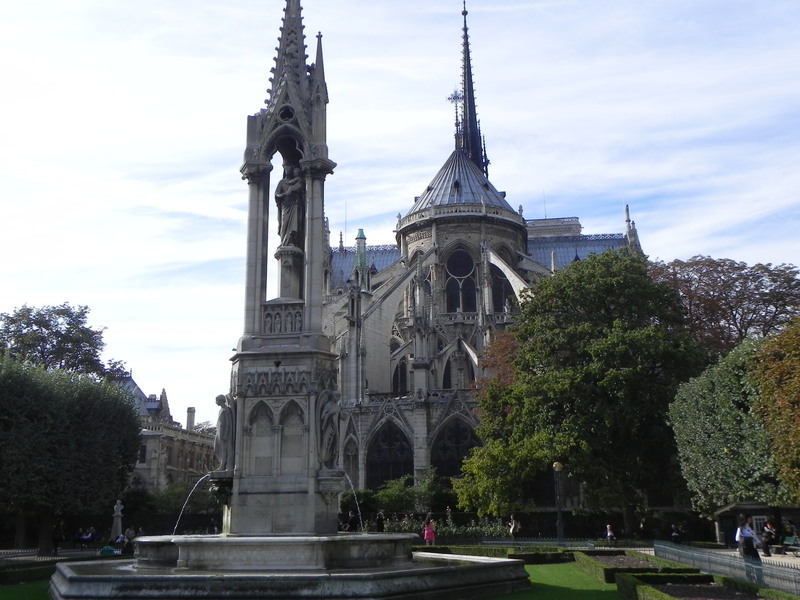 Thus, it is solely for your benefit, dear Readership, that I return to our beloved Paris in early April for an extended weekend of ET research and grocery shopping. 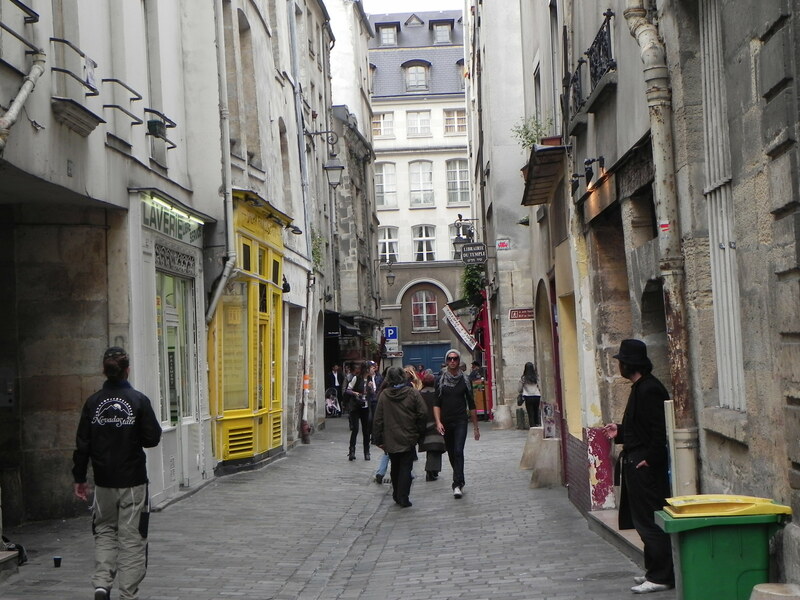 Is there falafel in my future on the rue des Rosiers? Nurse declined to come along because it’s a quick visit, but I have the next-best travel companion on board – Nurse’s daughter, Associate ET Melinda. 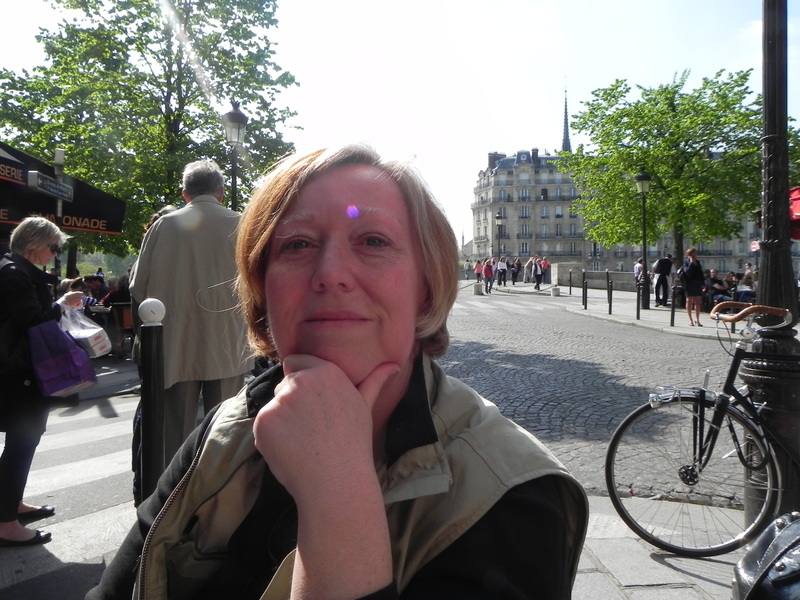 Melinda is an excellent photographer, a first-class shopper and a true food enthusiast. She will be a boon companion and a welcome addition to our blog. Fans of Nurse will be pleased to know that she’ll oversee operations from Command Central, directing our every move via phone and text message. Believe me, nothing will get by Nurse and she has firm opinions about how this trip should go. You’ll be hearing from her! 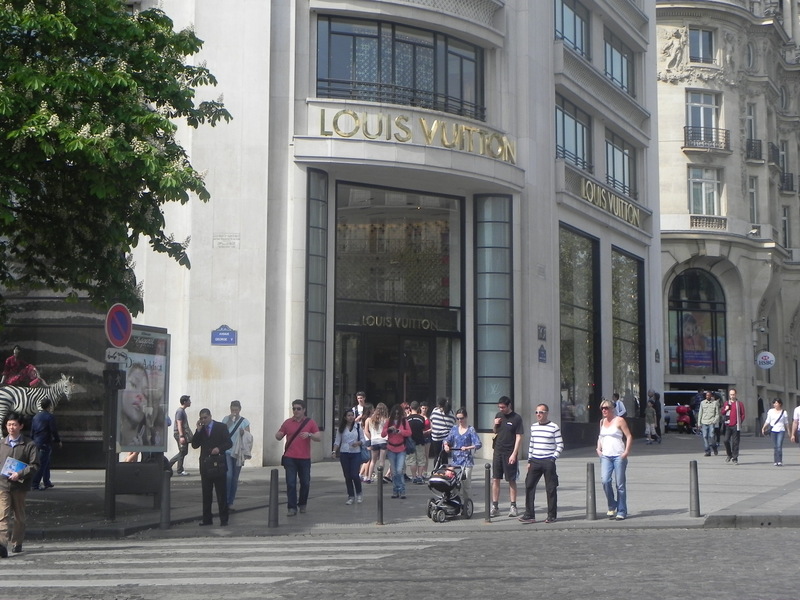 Melinda and I will make the most of four days in the streets and boulevards. My cunning plan will keep us busy exploring neighborhoods and restaurants. I have accounted for the mission-critical aspects on my ET spreadsheet; Omlettes – check. Croissants – check. Pâté and a crisp Sancerre – check. 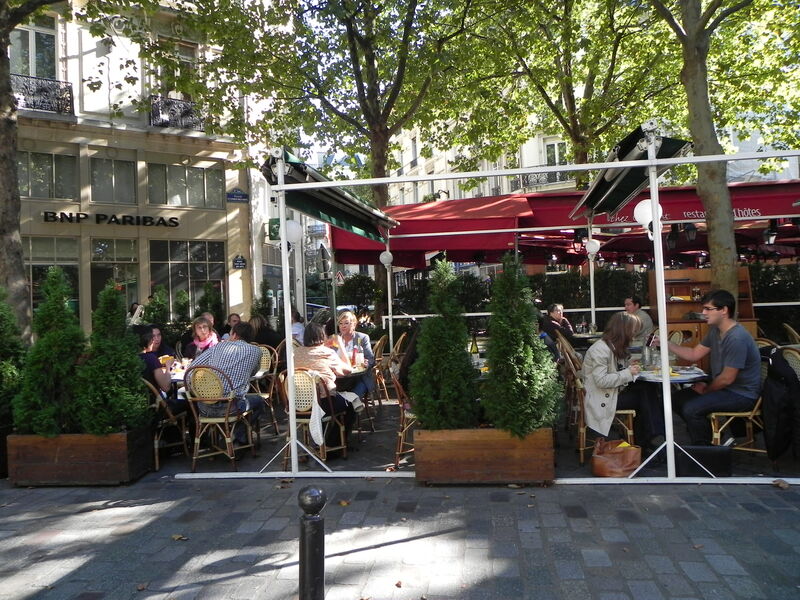 It’s been a long winter and I am ready for spring in Paris. 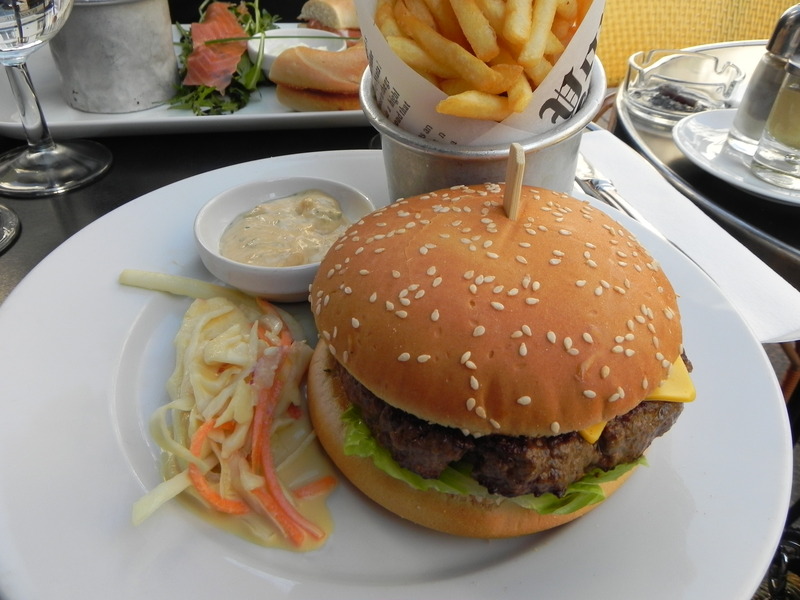 Yes, I'm dreaming of this hamburger. It was spectacular. 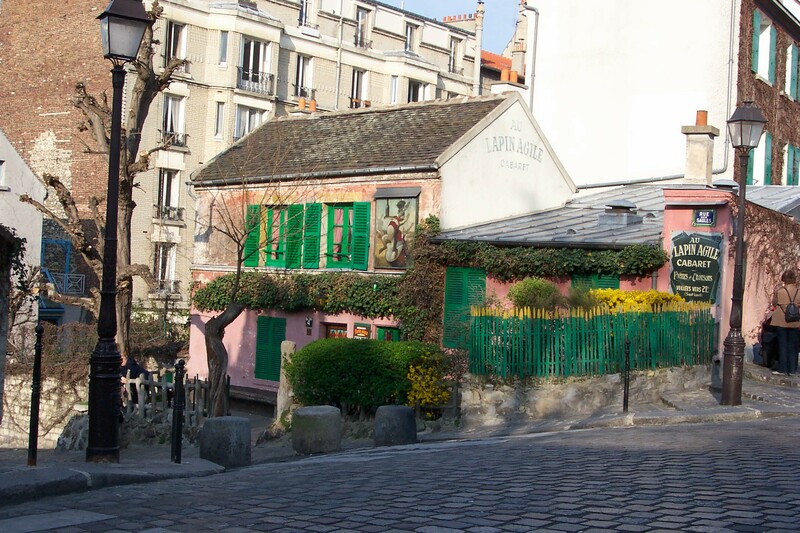 I want to prowl the less-touristed streets of Montmartre and watch edgy young “Bobos” on the cafe terraces near the Canal St. Martin. 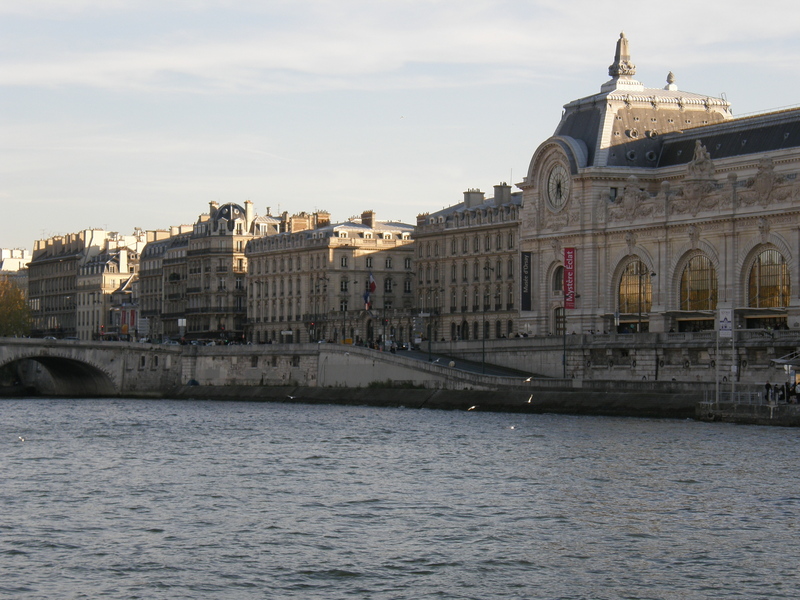 I’m curious to explore elegant Passy and we will lunch-tour at the popular Wine Museum. Maybe this time I’ll genuflect at Proust’s cork-lined bedroom, where he wrote his masterwork and ate takeout ice-cream from the Ritz. Why not suggest a sight or a memorable meal using the Comments link below! 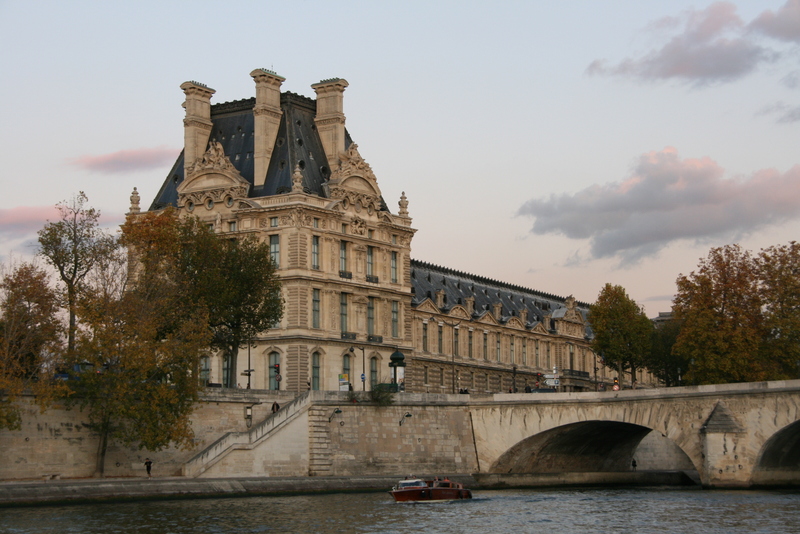 We travel to serve to the Readership so you can wine, dine, shop and explore Paris along with us. Pray for good weather and watch for real-time reports. Oh, la la.